Photo too big or the wrong fit? Fotor has you covered. Use our photo resizer to resize your image to any size you want without cropping it! Resizing photo online has never been so easy! Allowing you the ability to resize, reshape and modify your images without cropping, Fotor’s photo resizer gives you all the necessary options to maximize your photos. 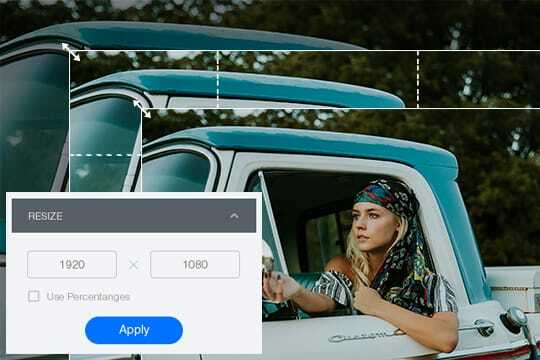 Providing you the means to change the size of your image for Facebook, Instagram and other occasions, Photo Resize incorporates other functions such as ‘Basic Edit’, ‘Collage Maker’ and ‘Graphic Design’ to make your image perfect. Begin your editing today! Open the Photo Resize and the image you want to edit. Type proportions in the "Width" and "Height" fields or enter a percentage to determine the size of the photo. Check the "Keep Proportions" option to if you want to maintain the proportions of you original image. After resizing the image, save and choose format it to suit your needs. Never worry about your photo is of a wrong size again! With Fotor’s image resizer, resizing photos online can be easily done within a few clicks! You can either choose to resize pics freely or to keep the original portion. Start image resizing using Fotor today!